We are a leading Manufacturer of tooled western saddle, echo leather western saddle, leather western saddle, western show saddle and show fitting western saddle from Kanpur, India. 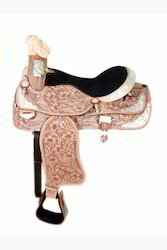 We are a remarkable entity, engaged in offering a high quality range of Tooled Western Saddle. 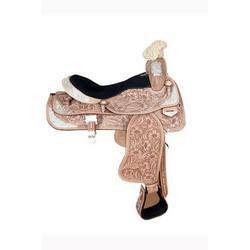 This western saddle is designed by utilizing best material and newest ideas by team experts. 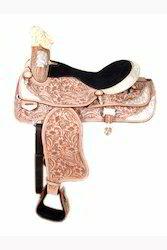 The offered western saddle is examined on factors which ensure the quality of this specific product. Along with that, we provide this western saddle to our customers at different stipulations according to the need defined by our customers. 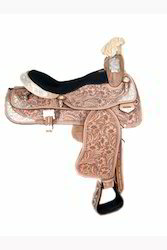 Also, our patrons can buy this western saddle from us at vary affordable rates. Backed by rich domain proficiency, we are engaged in offering an inclusive array of Echo Leather Western Saddle. Our given range of western saddle is manufacturer on the observation of professionals by using leather and innovative technology according to the market standards. 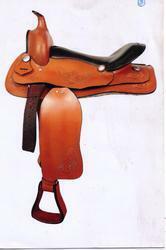 The given range of western saddle is provided in numerous finishes which suits the needs of our customers. Available with us is a wide gamut of Leather Western Saddle. The presented range of western saddle with carven is designed by consuming quality examined material and latest machines. This western saddle with carven is broadly applauded in the industry for its quality. Along with this, our customers can take this western saddle with carven from us in number of specifications with packaging options. 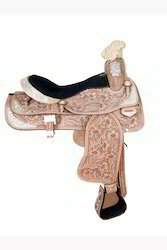 Leveraging on the expertise of our professionals, we are offering a wide range of Western Show Saddle. For manufacturing this western show saddle, our team people utilize only best materials and latest machines according to the market standards. In addition to this, the offered western show saddle is successfully made according to the stipulations specified by our customers & provided at affordable rates. Looking for Western Show Saddle ?